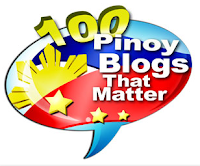 Renaldo Balkman meltdown and choking incident last March 8 gets a decision from PBA: a lifetime ban and P250,000 fine for ex-NBA player Renaldo Balkman. 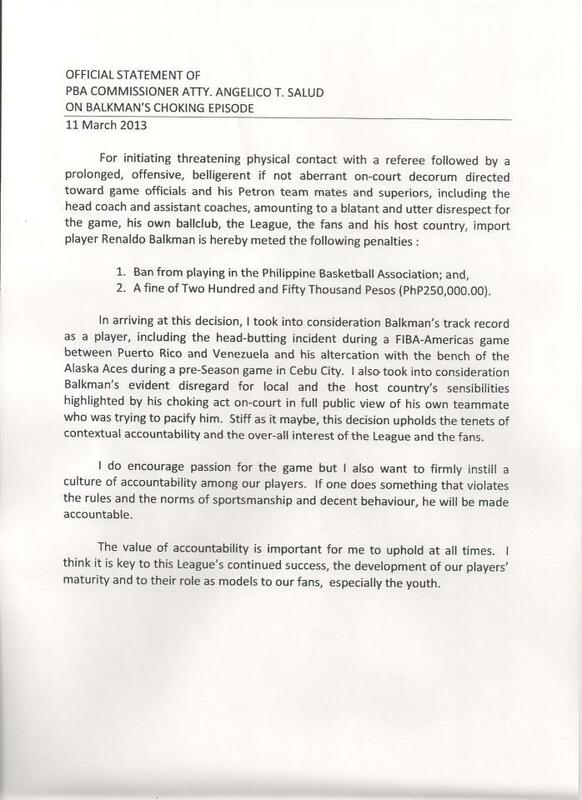 PBA's major decision came 3 days after Renaldo Balkman's meltdown on-court last Friday when he pushed his team's assistant coach Biboy Ravanes, then shoved referees and teammate Ronald Tubid. Balkman also choked another teammate Arwind Santos who was only trying to pacify him. The outburt stemmed from Balkman being too frustrated of his team's loss to Alaska Aces, 73-83. Renaldo Balkman, 28, is a former NBA player, who played for the New York Knicks from 2006 to 2008, then for the Denver Nuggest 2008–2011 and returned to New York Knicks during the 2011-2012 season. Renaldo Balkman and his teammates have already patched things up, and Petron Blaze Booster is very much willing to give him another chance. 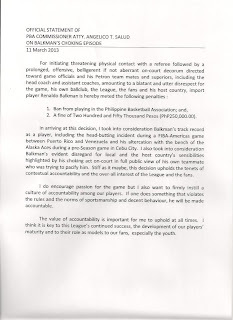 But despite his team backing him up on this one, PBA has still made a decision of banning Balkman for life. Some find it harsh and a ban from playing this season would have been more appropriate, but others believe the decision is just fine and morally right for someone who disrespected PBA and the viewing public. SMC to pull out of PBA? San Miguel Corporation (SMC) who owns Petron Blaze Boosters and 2 more (San Mig Coffee Mixers and Barangay Ginebra San Miguel) hinted of a possible pull-out following PBA's decision on Renaldo Balkman. According to a tweet by ABS-CBN News Sports writer Camille B. Naredo, SMC will re-evaluate the company's participation in PBA. "SMC accepts PBA decision to ban Balkman but management is "re-evaluating" the company's participation in the league."